Our Blog How Do I Become A College Gymnast? It is almost every gymnast’s goal to become a college gymnast. 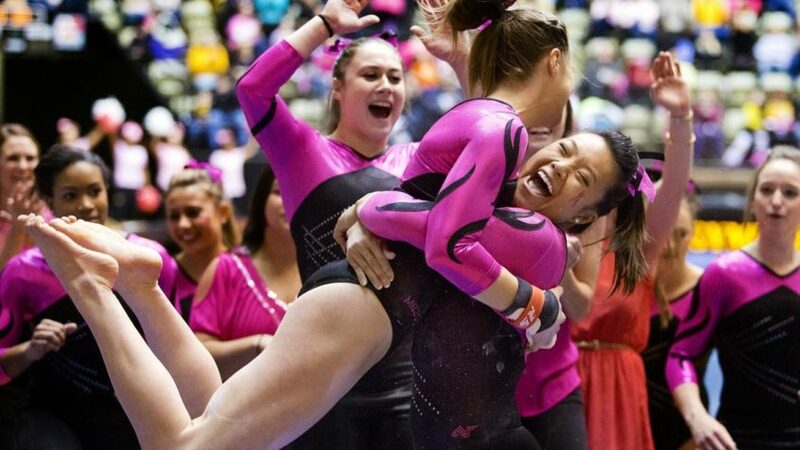 Becoming a college gymnast is not easy and takes a lot of work but here are some useful steps to help prepare yourself or your gymnast on their journey to college gymnastics. A very important step to becoming a college gymnast is to first become a high-level gymnast. Level 10 and elites usually become college gymnasts. It is important to be a level 10 or elite while looking for a college to do gymnastics at because NCAA Gymnastics competes at a level 10 difficulty. To get noticed by college coaches it will help to compete at the Junior Olympics, also known as J.O.s. J.O.s is the last competition of the level 10 season. Every level 10 gymnast from across the nation fights to get a spot to compete at J.O.s. It is very easy to get contacted by a college if your name is out there in the gymnastics world. By doing this, without being an elite and competing at national competitions, you need to be bold. Talk to your coaches and ask to go the big competitions that college coaches will be at. For example, the Nastia Liukin Cup is for the top level 10 juniors and seniors in the country. Nastia is the host and college coaches go to the Cup to watch. If you make it to the Nastia Cup then your name will be on the coaches’ radar. Also, go to big name meets like the Texas Prime Meet, Presidential Classic or Pikes Peak Cup. All of these meets are well-known meets and will help with getting your name out in the gymnastics world. Another way to get your name out there is to go to college gymnastics camps, but that requires its own section. Talking to colleges just recently became harder for girls who are in high school. There is a new rule that gymnasts cannot talk to colleges before their junior year of high school. Before this rule was made, gymnasts were committing to colleges as early as their freshman year of high school. That puts gymnasts at 14 or 15 when verbally committing to a college. Of course, gymnasts will still be able to go on unofficial visits but they will not be allowed to talk to the coaches. One way to get around that though is to have your club coaches talk to the college coaches. Also, start applying to colleges your junior or senior year of high school because if you are excepted to the school then it’ll be easier to get an offer onto the gymnastics team. Making a YouTube page will be crucial for your future career as a college gymnast. From the time you are a level 9 start posting videos on the Internet. Include your name, gym name, level, and graduation year from high school. You can post all of your videos and when coaches hear who you are or you catch their eye at a meet then they can look up your videos. They can go through any video you have posted and see how you have improved from your level 9 year to where you are now. Plus, it is always fun to watch yourself doing gymnastics because you can see how far you have come and you can see what you could do better. Step 5: Go to College Gymnastics Camps! Another step, as I mentioned earlier, to becoming a college gymnast is college gymnastics camps. Gymnastics camps are so huge nowadays. Almost every single college gymnastics program offers at least one college gymnastics camp each summer. At gymnastics camps, college coaches get to see you working on your new upgraded skills. They get to work with you 1-on-1, they get the chance to talk to you, and just see how you are in a workout setting and not just the competition setting. Even if you are dead set on wanting to go to a certain college, try to go to multiple gymnastics camps. It helps get your name out there and opens up more options for your gymnastics future. Hi, I am an Excel Gold (competitive team ), but I am on a level. However, that is totally a path I want to take and I am trying to become a collage gymnast. Is there any tips for success? P.S. I win almost every meet, I think I’m ready for the levels. Considering my age (13), how can I speed things up? First you need to get into a gym that offers the JO (Junior Olympics) training program. You will not be able to progress to level 10 without being in JO. From Xcel you can move to JO as a level 7 if you are 14 yrs old and entering 9th grade. If you are not yet 14 entering 9th grade, or are not quite a level 7, (Xcel gold are generally around level 5) you can get placed in a JO level then you will be required to compete JO levels 4 and 5 before you can progress to level 6 or 7 or higher. The good news, say you were evaluated and the coach said you were a level 6, you would only need to compete levels 4 and 5 once or twice to get a high enough score tonpass outbeam of that lecel, to then begin competing the appropriate level. If you enter JO as a 14 yr old 9th grader at level 7 you do not have to go back and compete levels 4 and 5 but can move forward from there. The first step I would advise you to take is find a gym near, call them and explain your situation and make an appointment to be evaluated. Then you will have a better sense of what your level is and can decide what is the best path for you. You are a little on the older side but don’t get discouraged, gymnasts who are talented and willing to work very hard can progress through the levels fairly quickly. Hi, I was wondering I am in level 7 right now (and i’m 15) If I have a chance of competing in college gymnastics?